Owl experts say that the world’s biggest owl is the Eurasian Eagle Owl. Some people say that the Blakiston’s Fish Owl is bigger, but this has not been proved. The Eurasian Eagle Owl has a wingspan of 138-200cm (55-79in) and measures 58-75cm (23-30in) long. 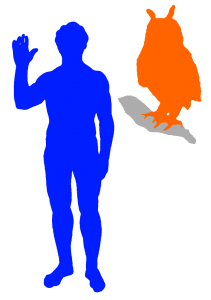 Females weigh 1.75-4.5kg (3.9-10lbs) and males weigh 1.5 -3.2kg(3.3-7lbs). The Eurasian Eagle Owl is a large owl with big ear tufts and bright orange eyes. The males’ ear tufts are more upright than the females’. The chin, throat and chest are white. The front of the owl has a dark wavy pattern. In fact, the colour of the Eurasian Eagle Owl depends a lot on exactly which subspecies it is. Its beak is black and very obvious. They are very powerful bird. They can fly powerfully like a hawk. They have feathered toes which are long and powerful. Their talons are larger than a leopards’ claws and they are black. The Eurasian Eagle Owl, like all other owls, has the ability to point its talons forwards or backwards while hunting. It feeds on small mammals, like voles, rats. mice and rabbits. However, they are even able to kill prey the size of a fox or a young deer. They also eat other birds such as woodpeckers, ducks, sea birds and geese. The male Eagle Owl has a deep monotonous “ooh-hu”. The female’s call is slightly higher in pitch. It sounds “uh-hu”. Each Eagle Owl can be identified by its different call. They are active at night. They usually nest on the cliff ledges in late winter. The females only lay her eggs once a year. She lays about 1 to 4 white eggs. The eggs are about 56-73mm long and 44-53mm across (2.2-2.9″ long and 1.7-2.1″ across) . They weigh 75 – 80g (2.6-2.8 oz). She lays the eggs 3 days apart. The mother owl is the one keeping the eggs warm until they hatch. It takes about 31-36 days for the eggs to hatch. While mum keeps her eggs warm, dad will go out hunting for food for her. Once the eggs hatch, the chicks are taken care of for about 2 weeks. Mum will bring food back, and will feed small pieces of food to her chicks. At 3 weeks the chicks start to be independent. They will feed themselves and begin to swallow food whole. At 5 weeks the chicks began to walk around the nesting area. Then at 52 days, they are able to fly a few metres. They may leave the ground nests as early as 3-4 weeks old but if the nest is on the higher ground, the chicks will wait longer, only leave them at the age of 5-7 weeks. Otherwise they’d fall to the ground and not be able to get back! The young birds which have wing feathers and are large enough to fly are cared for by both mum and dad for about 20-24 weeks. 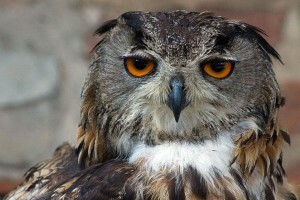 The Eagle Owl can live up to 20 years old in the wild but in captivity they can live up to 60 years old. They have no predators of their own apart from humans. They are found in all parts of Europe and the Middle East and also on the African continent. They are very resilient and are able to breed in the extremely dry Sahara Desert. However, they do prefer to nest near woodlands, river valleys, ravines and rocky areas.